In 1980, the US Mint corrected their oversight during the previous year. The 1980 mint set contained three Susan B. Anthony dollars and a total of thirteen coins in two pliofilm sleeves. The previous year, the US Mint made the decision not to change the pliofilm sleeves to include a San Francisco minted Anthony dollar coin. The 1980 mint set consisted of three Susan B. Anthony dollars and two each of the Kennedy half dollar, Washington quarter, Roosevelt dime, Jefferson nickel and Lincoln penny. 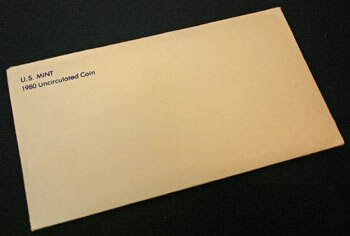 For the 1980 mint set, the US Mint continued to use a sturdy white envelope with "US MINT" and "1980 Uncirculated Coin" in bold, blue font in the upper left corner. 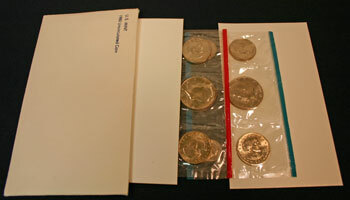 The two pliofilm sleeves, one with seven coins and one with six, were placed between two pieces of cardstock to help protect the uncirculated coins inside the envelope. On the left, the red-edged pliofilm sleeve holds the six coins from the Denver mint along with the dollar coin minted in San Francisco. The coins minted in Philadelphia show on the right in the blue-edged sleeve. In the mint sets of earlier years, the "Philadelphia" sleeve contained the additional penny produced at the San Francisco mint. This year has the additional coin in the Denver sleeve. In the mint set's Denver pliofilm, the two Susan B. Anthony dollars are on either side of the Kennedy half dollar. For the Philadelphia coins, the dollar coin is to the left of the half dollar with the quarter dollar coin on the bottom right. Each coin is loosely sealed within its own compartment allowing it to rotate into various positions. Turning the pliofilm sleeves over, the reverse images of the coins in the mint set can be easily viewed. It takes a closer look to determine which are the dollars and which are the quarters. Click on Mint Set Population to view the contents of the sets through the years. Take a look at the overall Mint Set page to see how the values compare among the sets. The US Mint produced more than 600 million of the new, smaller Susan B. Anthony dollar coins in an effort to reduce the cost of frequently replacing the dollar bills. But, the general populace does not favor the new coins. As a result, the Treasury Department has teamed with the US Post Office to use the dollar coins as change in all of their offices across the country. The offices will provide them in change unless their postal patrons object to receiving the dollar coins. Once again copper prices are rising. The US Mint fears people will begin hoarding pennies like they did in the mid-1970s. At 95% copper, the penny now costs more than one cent. Though studies suggest doing away with the penny, officials claim that is not likely. Instead, they are researching different metals for the penny. To date, the US Mint has produced 785 million Susan B. Anthony dollar coins with 285 million in circulation and 500 million in inventory. With such a high inventory, the US Mint will halt production of the dollar coins and increase production of the penny which is in demand due to the increase in copper costs. Recently the Mint's orders for the dollar coins have increased due to the joint efforts with the post offices to use the coins as change. But, even with the increase, the inventory will last several months. The US Mint has finally begun filling orders for the long-awaited "John Wayne - American" medal. The gold medal was authorized nearly a year ago by President Carter. In addition to the gold coin minted for the Wayne family, the US Mint is producing exact replicas in bronze. To date, over 300,000 orders have been received. The bronze medal will be available in two sizes: 3 1/2 inches for $8.30 and 1 5/16 inches for $1.10. Various areas around the country are experiencing a shortage of pennies. Some banks are offering coupons for free hamburgers to their customers who turn in $5 in pennies. US Mint officials claim there's no reason for the shortages but there's evidence of hoarding. Due to delays in printing and distributing the order blanks, the one-half ounce medallion recognizing singer Marian Anderson has been postponed to July 15. The price for the medallions will be re-set each day based on the previous day's closing price of gold. After more than four decades, Americans were not allowed to own gold except in a few examples such as jewelry or rare coins. The US Mint will begin selling gold medallions commemorating Marian Anderson first then Grant Wood. The medallions are not legal tender even though they are made of gold. Due to the fluctuations of the price of gold, collectors will have to pick up an order form from the post office, call a toll free number to get the day's price, obtain a cashier's check or money order, then have the post office validate the order date before submitting the order. The US Mint will limit the number of medallions produced. Banks and businesses are feeling the shortage of pennies. The US Mint increased penny production to 55 million per day, but people are still hoarding their cents. Some banks are offering more to people who bring in pennies - for example, $1.25 for a dollar's worth (100) of pennies. A nationwide hamburger chain offers a free dessert to anyone who pays for their meal with 200 pennies. Some banks refuse to "sell" large quantities of pennies to individuals, only to businesses. Soon, collectors will be able to order the 13-coin 1980 uncirculated mint sets. This year's set will include the Susan B. Anthony dollar minted in San Francisco. All of the coins will have a mint mark except the one cent coin minted in Philadelphia. Also, the US Mint may soon re-market the bicentennial silver-clad coins in the proof and uncirculated versions. But, the price will be higher than the initial prices of each set. It remains to be seen if the new gold medallions will have any numismatic value. For now, their value rests in their gold content. Currently, gold is at $671 on the London market. Many expect it to be over $1000 soon. Not fully on board with the medallion program passed by Congress, the US Mint is making the purchase of these medallions difficult primarily due to the gold price fluctuations. The new gold medallions are selling well just after a week on the market but not at an overwhelming rate. Mandated by congress, the medallions sell for the price of gold plus a fee to recoup production costs. The medallions are not money, as such the Treasury Department will not "buy" them back. This first year, the honorees for the medallions are Marian Anderson (1/2 ounce) and Grant Wood (1 ounce). In 1981, Willa Cather and Mark Twain will be recognized followed by Frank Lloyd Wright and Louis Armstrong then Alexander Calder and Robert Frost, and the fifth year - John Steinbeck and Helen Hayes. While the driver slept in his rig, thieves broke into the trailer hauling $800,000 in coins and were able to steal $32,000 in dimes. The private carrier was hauling the coins from the Denver mint across the bay to a Bank of America in San Francisco. The driver woke and fired shots at the thieves, but they got away with 32 bags of dimes weighing 50 pounds each for a total of 1600 pounds of coins. The 1980 Mint Set Year included news of the lack of acceptance of the Susan B. Anthony dollar coin, the new gold one-ounce and half-ounce gold medallions and the value of the copper in pennies. © Copyright Atlanta Coin Expositions, 2008-2016. All Rights Reserved. Several of the links on the pages within this web site go to affiliate vendors. A vendor affiliation can mean a small monetary compensation to the web site owner.